On February 19th, 2018 Gary Public Transportation Corp (GPTC) launched its new Broadway Metro Express. 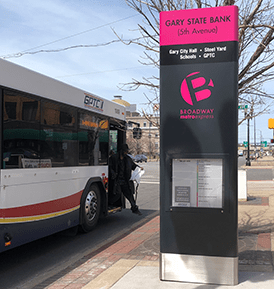 This is the first BRT style, rapid bus service project in the agency’s history, which began as a private streetcar service when Gary was founded 110 years ago before becoming a public agency in 1974. Broadway Metro Express, Bmx for short, runs along an 11-mile stretch of roadway from downtown Gary’s Metro Center terminal and into suburban Merrillville. The bus rapid transit style service offers increased frequency and limited stops, reduces passenger ride time, adds bus-only bypass lanes at most newly sheltered stops, and includes highly visible and cohesive stop signage. Funding for the Bmx includes support from the city of Gary, town of Merrillville, the Gary Sanitary District, Lake Michigan Coastal Program, the Legacy Foundation, Indiana University Northwest, Ivy Tech, the NWI Regional Planning Commission, the U.S. Department of Transportation and the Indiana Department of Transportation. David Wright, GPTC’s Planning and Marketing Manager states that this corridor was chosen in part because the planning effort that launched it – Livable Broadway Regional Plan – identified the area as ripe for future land use and development improvements. “We feel that incorporating BRT elements now into the new Bmx service – like easy-to-see kiosk-style information displays and sheltered stops with bus only bypass lanes for quick passenger boarding – will set us up for success to complement future development projects along Broadway,” said Wright. Fully 31% of Gary residents live within 1 mile of Broadway and 20,700 employees work along the Broadway corridor. It’s the system’s busiest transit corridor. Adding many BRT-type options to the Bmx was a priority for GPTC. Specifically, ensuring the new bus stops are highly visible was a major goal. Working with shelter and signage fabricator Tolar Manufacturing Company of Corona, California and Nancy Schoon, a local Gary Indiana graphic designer commissioned by the Legacy Foundation, the 17 Bmx stops are easily identified along the transit corridor with brightly branded totem-style kiosks rising 10 feet from the ground. Each larger-than-life kiosk includes easy-to-read identifying locations at the top followed by major nearby destinations served, Bmx branding and a color-coded route map. The color-coding coordinates with the actual stop color incorporated into the totem-signage. Importantly, each BMX stop includes a modern yet durable shelter complete with weather protective arched roof, bench seating, and solar security lighting. 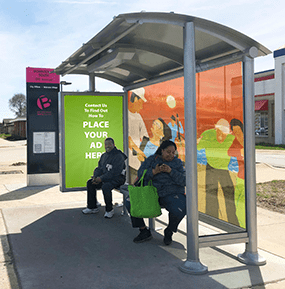 Soon, some of the shelters will incorporate local public art on the rear wall and revenue-generating advertisements will be encased in a large, 22” X 25” double-sided information display. “This project for Gary, Indiana was a great collaboration,” stated Scott Williams, Tolar Manufacturing Company, Business Development Manager. “Creatively approaching the new Bmx rapid bus service by incorporating BRT elements demonstrates GPTC’s forward-thinking willingness to take steps now towards full BRT implementation in the future.” With the installation of bus-only lanes at many Bmx bus stops, GPTC states that full bus-only lanes are one of its long-term goals to begin operating a truly complete BRT service.